KONICA MINOLTA DIGITAL CAMERA For the next few days we’ll take a look at some cars and trucks seen out and about at local cruise-ins, car shows, and other special events. 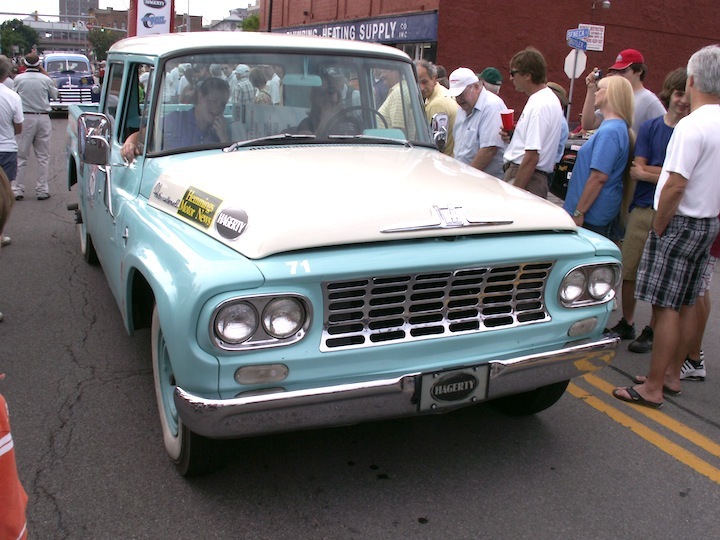 Like this 1962 International-Harvester Travelette ¾-ton pickup. It was driven by the team of Tabetha Salsbury and Kacy Smith in 2012’s Hemmings Motor News Great Race, which passed through WNY in June of that year. They were the only “all girls” team in the race, and for sure were driving the only I-H. The truck is part of the Hagerty Family Collection — that’s Hagerty as in The Hagerty Group, which sponsored the race and who specialize in classic vehicle insurance. You can read a race blog entry written by Salsbury here: http://www.hagerty.com/articles-videos/Articles/2012/06/27/The-Great-Race-Beautiful-scenery-hospitality-and-friendly-rivalry-mark-Girls-Teams-experience and you can take a virtual YouTube ride in the truck here: https://www.youtube.com/watch?v=13Y1FD3D3gc — Jim Corbran, RRofWNY The post RealRides of WNY appeared first on Buffalo Cars.